The Red Sox announced today that they have acquired infielders Jemile Weeks and Ivan De Jesus from Baltimore in exchange for infielders Kelly Johnson and Michael Almanzar (pictured right). It was a familiar trade for both sides. Baltimore selected 23 year-old Almanzar in the Rule 5 draft last winter. He was ultimately returned to the Red Sox in June after spending the majority of his time with the Orioles on the disabled list. 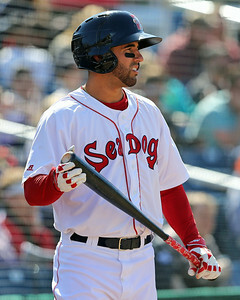 Since he was returned to the Red Sox he has played third base for the Portland Sea Dogs, hitting .277/.356/.422 with five home runs over 188 at-bats. Kelly Johnson was acquired by the Red Sox in exchange for sending Stephen Drew to the Yankees in a deadline deal earlier this year. Johnson appeared in only 10 games for the Red Sox and ends his time with only four hits over 25 plate appearances with 10 strikeouts. 8/31 Cup of Coffee: Pawtucket took a loss, tightening the Wild Card race while Portland set a franchise record. Salem took both games of a double header while Greenville won by two. Lowell was shutout and the GCL took game one of their playoff series while the DSL Red Sox bested the Royals. Matt Barnes took the loss in this one, his ninth of the season. Barnes went seven innings, giving up five runs on seven hits while walking none and punching out 10 batters. Miguel Celestino came on in relief and gave up a single hit, a solo home run, in two innings of work. The PawSox managed only five hits in this game, two off the bat of Bryce Brentz, including a two-run double in the top of the first inning. 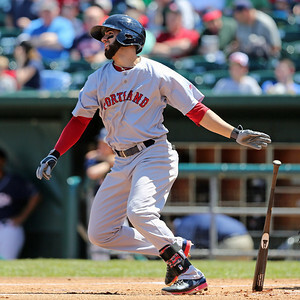 Blake Swihart, Alex Hassan, and Garin Cecchini collected the remainder of the clubs hits. The loss, coupled with a Buffalo (TOR) win, puts the PawSox out of the race for their division crown, but leaves them 1.5 games up on Buffalo in the Wild Card hunt. 8/30 Cup of Coffee: All of the affiliates were in action and all but two teams picked up wins. Both the PawSox and Sea Dogs won by a single run, while Greenville and Lowell won blowouts. The GCL Red Sox notched a victory in their one-game semifinal. The Salem Red Sox lost late, while the DSL Red Sox gave up a walk off. Brandon Workman was on the hill in this one, and largely held the Chiefs at bay. Workman went 6 2/3 innings, allowing just one run on three hits and two walks while punching out six. Workman was relieved by John Ely who notched a perfect inning before being taken out. Dalier Hinojosa came on in relief of Ely to pick up his third save of the season thanks to 1 1/3 innings in which he allowed only one walk, while striking out one as well. 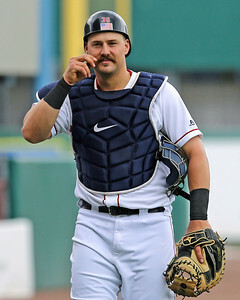 Ryan Lavarnway (pictured, left) provided all of Pawtucket's offense in this one, collecting two of the PawSox' seven hits, a double and two-run home run in the fourth inning to put the PawSox on top. Jackie Bradley, Jr. went 1 for 4 with a strikeout. With the win, the PawSox move 2.5 games up on the Buffalo Bisons (TOR) in the International League Wild Card standings, and are only two games back of the division lead with three games remaining. 8/29 Cup of Coffee: The playoff schedule kicked off on a historic note. DSL Red Sox starter Daniel Gonzalez and relievers Algenis Martinez and Carlos Caceres combined for a no-hitter in the first game of the playoff series against the DSL Royals. Elsewhere, the GCL Red Sox closed their regular season with a win and Pawtucket's victory helped solidify its playoff chances. Lowell provided plenty of excitement, with two players and manager Joe Oliver getting ejected before the first pitch, followed by the Spinners erupting for 13 runs. Portland fell in a pitchers duel, while Salem and Greenville both suffered blowout losses. In what turned into nearly a four-hour contest, the PawSox prevailed despite being out-hit 15 to 13. Every member of the Pawtucket lineup reached base, as the squad added seven walks to go with the 13 hits. Justin Henry led the way, going 3 for 5 with a walk and three runs driven in. Blake Swihart had the only extra-base hit for Pawtucket, a sixth-inning double. He was left stranded then, but overall scored once and drove in two as part of a 2-for-4 night. 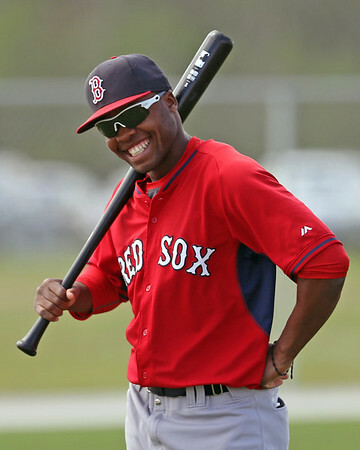 Jackie Bradley, Jr. was 2 for 4 as well, driving in a pair and walking once. Garin Cecchini added his third consecutive multi-hit game. After struggling badly in June and July, the 23-year-old has turned a corner in August, hitting .349/.429/.535. Pawtucket pitchers allowed 22 baserunners, but the damage was limited as the IronPigs went 4 for 17 with runners in scoring position, Ryan Verdugo got the spot start in place of Anthony Ranaudo, who will be called up to pitch the major league game against Tampa Bay on Friday. Verdugo lasted 4 2/3 innings, allowing three runs on six hits. He walked three and struck out eight. Chris Hernandez struggled but got credit for the win. The left-hander allowed two runs on four hits in 1 1/3, issuing two walks without a strikeout. Drake Britton played Houdini, allowing four hits and two walks in 1 2/3 innings but escaping without giving up a run. Heath Hembree struck out three batters in his scoreless 1 1/3. With the win, Pawtucket remains 1.5 games ahead of Buffalo for the wild card spot with four games remaining. 8/28 Cup of Coffee: It proved to be a down day on the farm as the affiliates were only able to bring home two victories. Salem split a doubleheader against Frederick, while the GCL Sox exploded for 14 runs against the Orioles. Elsewhere, offense was at a premium as Pawtucket, Portland and Greenville all had weak nights at the plate. Lowell lost in heartbreaking fashion in Connecticut as their playoff hopes were further trimmed. It was a quiet night at the plate for the PawSox, who collected just five hits on the evening. 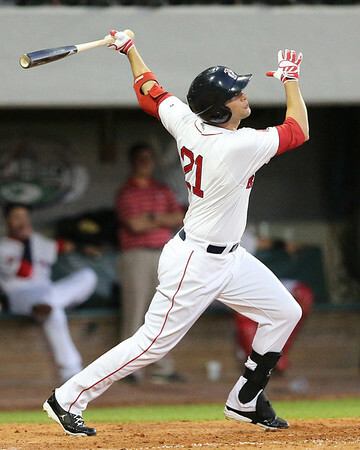 Garin Cecchini was 2 for 3, including an RBI single in the ninth inning, to lead the Pawtucket offense. Steven Wright dropped to 5-5 after allowing five runs on 12 hits and two walks in six innings of work. Miguel Celestino added two perfect innings of relief, striking out three. 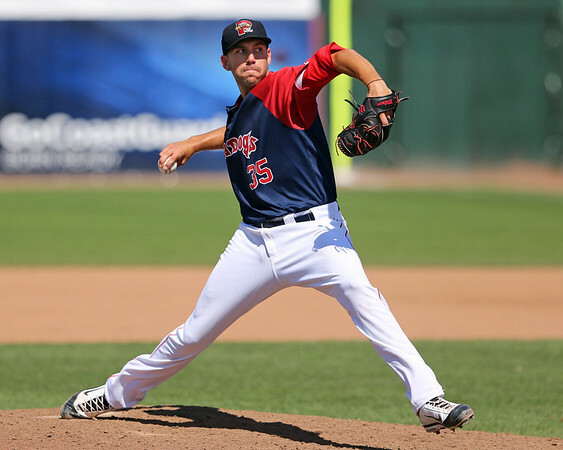 Brain Johnson's season-long resurgence continued last Saturday night at New Hampshire (TOR) in which he allowed three base runners and a single earned run, coasting easily to his fourth SoxProspects.com Pitcher of the Week award. His ten strikeouts were two short of his season-high of 12. Johnson currently leads the Eastern League in ERA (1.83) and WHIP (0.96). 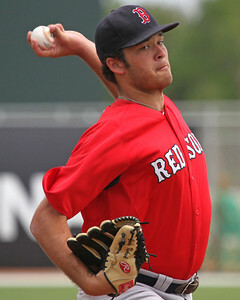 He is currently the eighth-ranked prospect in the organization by SoxProspects.com. 8/27 Cup of Coffee: The PawSox had a strong showing at the plate as they easily handled Buffalo. 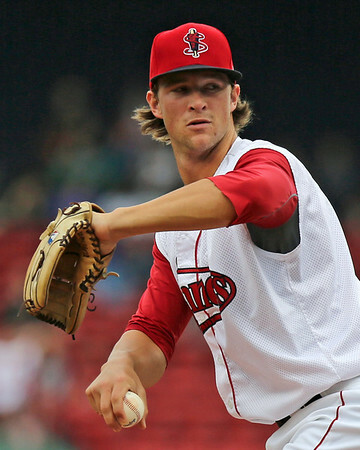 Despite a loss, one of the Red Sox top pitching prospects was impressive in Portland. The GCL Red Sox secured a playoff berth as they rode a strong pitching performance to victory. Henry Owens notched the victory, allowing three runs on eight hits and four walks in 6 1/3 innings of work. The left-hander struck out eight Bisons on the evening and has now punched out 35 hitters in 32 innings as a member of Pawtucket. Dallier Hinojosa added 2 2/3 scoreless innings of relief, allowing a hit and striking out a batter. The PawSox compiled 17 hits on the evening, as Ryan Roberts was the only member of the starting lineup to not collect a hit. Bryce Brentz was 2 for 5 with a key three-run home run in the fifth. Alex Hassan was 3 for 5 with a run scored and two doubles while Deven Marrero was 2 for 5 with two doubles and an RBI. Garin Cecchini continued to remain hot at the plate, going 2 for 5 with a double and an RBI. Jackie Bradley Jr., in one of his best games since rejoining Pawtucket, was 3 for 6 with a double and an RBI. The win gives the PawSox a two game cushion over Buffalo in the wild card standings. The Arizona Fall League (AFL) rosters were announced today, and the Red Sox will be sending six prospects to play for the Surprise Saguaros. The list is headlined by infielders Deven Marrero (pictured) and Sean Coyle, while pitchers Keith Couch, Aaron Kurcz, Robby Scott, and Madison Younginer will join them. The Red Sox also have an outfielder listed as TBD, and as Alex Speier of WEEI.com notes, that spot could go to Rusney Castillo. When Jose Iglesias was signed in September of 2009, the Red Sox sent him to get at-bats in the AFL that fall, and this situation with Castillo is quite similar. 8/26 Cup of Coffee: While Monday was yet another day of fantastic pitching down on the farm, it was one of the organizations most exciting young bats that stole the spotlight. First-round pick Michael Chavis (pictured, left) collected six hits, including his first professional home run, as the GCL Red Sox split a doubleheader. A trio of Portland arms combined on a shutout win, while Pawtucket, Salem, and Lowell eached cruised to four-run victories. Matt Barnes continued his late-season resurgence with yet another strong start. The 2011 first-round pick allowed two runs on four hits in 7 1/3 innings, as he struck out four and walked two. In five August starts, Barnes has a sterling 1.30 ERA and has struck out 28 in 34 2/3 innings. Chris Hernandez tossed a scoreless final 1 2/3, allowing a hit while striking out one and walking two. The big blow for the PawSox came in the fourth inning, as Garin Cecchini drove a three-run double to deep center field. Justin Henry was 3 for 5 with a double and two runs scored, and Alex Hassan drove in a pair as part of his 3-for-4 night. The win moves the PawSox a game ahead of Buffalo in the wild card race with seven games remaining. At the start of the week the Red Sox were among six teams connected to Cuban outfielder Rusney Castillo (pictured right), who defected earlier this year. By midweek the list was down to three teams, and on Friday news broke that the Red Sox had landed the 27 year-old for a record setting deal of seven years, $72 million. SoxProspects.com executive editor Chris Hatfield was all over the news and broke it down for you. Since the trading deadline had passed, the Castillo news proved to be the big news of the week both locally and nationally. Many writers and analysts broke down the signing, among them Dave Cameron of FanGraphs who compared him to Shane Victorino, and WEEI.com's Alex Speier who focused on how he can impact the Red Sox. If you want to see more of Castillo, Speier also posted a piece with Castillo’s promotional video featured on Jay-Z's Life+Times channel on Youtube, which is definitely worth a watch. 8/25 Cup of Coffee: Trey Ball and Garin Cecchini continued to turn their seasons around, Aaron Wilkerson continued his dominance over the New York-Penn League, and Luis Diaz was one of three pitchers to combine on a shut out for the Sea Dogs. Carlos Asuaje (pictured) had a ridiculous day at the plate, and a suicide squeeze won the game for Lowell. It was a tough day for the pitching staff, as the Bisons slugged five home runs, including a walk-off grand slam in the 12th. Anthony Ranaudo came up short in his attempt for his 17th win of the season between Pawtucket and Boston, allowing four runs on seven hits in 6 1/3 innings. Dalier Hinojosa allowed two more runs while recording only four outs, and Miguel Celestino allowed the grand slam to end it. Drake Britton tossed 2 2/3 innings of perfect relief, and he has now strung together three straight scoreless appearances. Edwin Escobar struggled mightily for Pawtucket, giving up nine runs (eight earned) on 11 hits in only 2 1/3 innings pitched. This marks Escobar's second straight loss in a Pawtucket uniform and his 10th between Pawtucket and Fresno. The bullpen did not fare much better as Ryan Verdugo would be touched up for three runs on seven hits in 4 1/3 innings and Brayan Villarreal would give up Buffalo's final three scores in only 1 1/3 innings. Despite collecting 11 hits, Pawtucket's offense was unable to do anything meaningful. Every starter with the exception of Deven Marrero had at least one hit and both Corey Brown and Blake Swihart had multi-hit games. Brown went 3 for 4 while Swihart was 2 for 3 with a walk. The only extra-base hits were doubles off the bats of Garin Cecchini and Ryan Roberts. 8/23 Cup of Coffee: Pawtucket was unable to sweep their series against the IronPigs while the Spinners fell to the IronBirds. The Sea Dogs finished off the Fisher Cats and Salem walked off with the win in extra innings thanks to a Jantzen Witte, bases-loaded single. Greenville defeated the Sand Gnats with the help of a hot bat from Cole Sturgeon. The GCL Red Sox lost in extras to the GCL Twins while the DSL Red Sox were postponed. Pawtucket failed to finish the four-game sweep of the IronPigs. Steven Wright took the loss for Pawtucket as he went 4 1/3 innings giving up seven runs (five earned) on eight hits while striking out four. The game was tied after three innings until the IronPigs broke things open with a run in the fourth and four more in the fifth. According to several reports, Cuban outfielder Rusney Castillo has agreed to a deal with the Boston Red Sox. MLB.com's Jesse Sanchez first reported that the deal was for six years, $72 million, but ESPN.com's Gordon Edes and WEEI.com's Alex Speier have reported that the deal is actually for seven years, beginning this year and running through the 2020 season. According to Baseball America's Ben Badler, who has written extensive reports on Castillo, the 5-foot-9, 205-pound 27-year-old's best tool is his plus-plus speed. Although scouts had graded his power as below-average to average while he played in Cuba, he has gained 20 pounds, mostly muscle, since his defection, and scouts at his workouts early this month increased their grades on his power to above-average. Castillo was primarily a line drive hitter, but his showcase batting practice showed a marked increase in raw power from his sessions during international competition. 8/22 Cup of Coffee: It was a day of tight action on Thursday. With a full slate of action, six of seven affiliates came away with victories. Four of those wins came by just one run, and two came on walk-off hits. 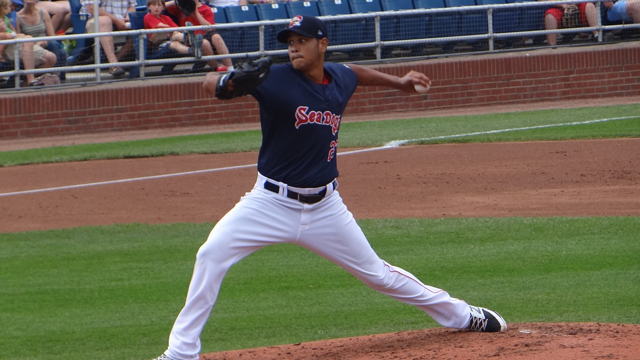 Eduardo Rodriguez (pictured) fired a gem but got a no-decision in Portland's 1-0 win. Pawtucket got a walk-off homer in the bottom of the ninth, while a bases-loaded single in the 10th carried Lowell. Salem strengthened its playoff push with a one-run win of its own. The GCL and DSL squads won by more comfortable margins, and Greenville fell to the only loss on the night. In his first game back with the PawSox after a brief stint with the major league club, Corey Brown blasted a tie-breaking one-out home run in the bottom of the ninth. It was the 17th of the year for Brown, leading the team. Jackie Bradley, Jr. also homered as part of a 2-for-4 effort. Bradley had not gone deep since May 31 while with Boston. After hitting 13 home runs between Pawtucket and Boston in 2013, he has only two this season. 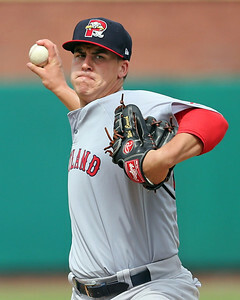 Henry Owens was masterful in his start, allowing two runs on five hits, needing only 96 pitches to complete eight innings. He struck out six and walked only one. Miguel Celestino got credit for the win with a perfect ninth, striking out two. PAWTUCKET, R.I. -- At Pawtucket’s All-Star break, not much was going right for Matt Barnes. He had given up six earned runs in his final start of the first half, landing the 24-year-old right-hander with a 5.06 ERA entering the break. But Barnes was not giving up on the season, and he took to Twitter before his first start of the second half to declare it was “[t]ime to turn it around and finish strong.” With a 1.63 ERA in six starts since, capped off by 6 1/3 shutout innings Wednesday night, Barnes is backing up his talk. 8/21 Cup of Coffee: It was a great day for the affiliates, as every team except Salem was victorious. Pawtucket got another stellar pitching performance as they shut out Lehigh Valley for the second night in a row. Lowell walked off with a victory as they returned from the All-Star break, while the DSL Sox clinched their division in an unorthodox way. A night after fellow rotation mate Anthony Ranaudo shut down the IronPigs, Matt Barnes (pictured, above) had no problem with Lehigh Valley. The 24-year-old right-hander tossed 6 1/3 innings, allowing just two hits and three walks while striking out seven. In five starts since the All-Star break, Barnes is 2-1 with a 1.95 ERA, allowing just 18 hits in 32 1/3 innings of work. Jose Valdez added 1 2/3 innings of scoreless relief while Heath Hembree pitched a scoreless ninth inning. In the second game of his rehab, Allen Craig was 1 for 3 with a run scored and two RBI. Ryan Roberts was 2 for 4 with two runs scored, a double, a home run and two RBI. Deven Marrero broke an 0 for 21 stretch with a single in the fifth inning. 8/20 Cup of Coffee: Pawtucket cruised to an easy victory thanks to the arm of one of the systems best pitching prospects. Portland and the GCL Sox held on to one run victories while the rest of the affiliates had a down evening. The New York Penn League All-Star game ended in a tie, despite the efforts of four members of the Spinners. Anthony Ranaudo (pictured, above) continued his stellar season by collecting his 14th win on Tuesday. The 24-year-old right-hander tossed six shutout innings, allowing seven hits and a walk while striking out four. John Ely hurled three scoreless innings of relief to pick up his first save. The PawSox offense was led by Garin Cecchini and Justin Henry, who were both 2 for 4 with a double and two RBI. Ryan Lavarnway was 2 for 2 with with an RBI and two walks as he continues to stay hot since the All-Star break, hitting .366/.519/.415 in 13 games. Jackie Bradley Jr., in his second game since being optioned to Pawtucket, went 2 for 5 from the top of the order. Couch twirled an impressive eight shutout innings of two hit-ball in his sole outing of the period against Richmond (SFG) August 16, holding the Flying Squirrels to a pair of hits while striking out seven. This outing continued a strong run of 19 scoreless innings dating back to July 29. Couch is currently the thirty-fifth ranked prospect in the organization by SoxProspects.com. This is his first SoxProspects.com Pitcher of the Week award of 2014. 8/19 Cup of Coffee: Only three affiliates were in action on Monday and the arms were in control, allowing a total of only four runs on the day. The DSL Red Sox clinched a tie for the division with their blowout victory. 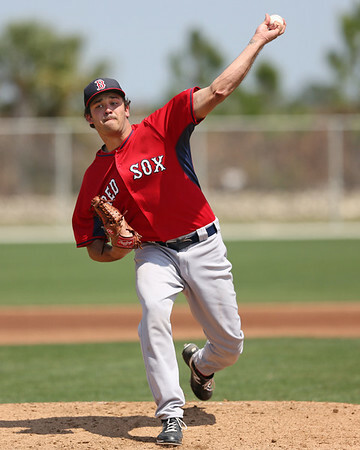 The Red Sox top two selections in the 2014 draft played key roles in the GCL Red Sox win, while Pawtucket failed to capitalize on several scoring opportunities in a shutout loss. The PawSox squandered several opportunities, failing to take advantage of the eight walks issued by Scranton pitching. Alex Hassan (pictured) had two of the three PawSox hits, and added a walk and a double. Ryan Lavarnway did not record an out, walking three times and hitting a single in his only official at-bat. Jackie Bradley, Jr., optioned to the PawSox earlier in the day, continues to struggle to get on track. The center fielder went 0 for 5 with two strikeouts. On the mound, Edwin Escobar was the tough-luck loser. The left-hander allowed two runs (one earned) on four hits in six innings. He struck out two but walked four. Despite issuing a pair of walks, Drake Britton had his first scoreless appearance in two weeks, striking out one and allowing two hits in two frames. Dalier Hinojosa struck out the side mixed with a pair of hits in a scoreless ninth. The Red Sox announced that they have recalled Mookie Betts from Pawtucket, while optioning Jackie Bradley, Jr. down to Pawtucket to make room on the roster. The move is somewhat surprising given that Bradley had reached base in eight of his last 20 plate appearances, but his .216/.288/.290 triple slash in 348 at-bats was not good enough despite his superb defense in center field. As Alex Speier of WEEI.com notes, Bradley can be called up in September when rosters expand, saving one of Bradley's two remaining options, as his minor league assignment will have been less than 20 days. While Bradley has struggled in Boston, Betts has been on a tear in Triple-A, collecting five multi-hit games in his 11 appearances since being optioned to Pawtucket on August 7. He has played center field in 10 of those 11 contests, and it is likely he will be the full-time center fielder for the Red Sox for the next few weeks, and possibly the rest of the season. If he is in fact done with Pawtucket, he will leave there with a final line of .335/.417/.503, with 11 steals and 19 extra-base hits in 45 games. One of the hottest hitters in the minors was promoted to Salem last week, as Manuel Margot (pictured) got the bump up from Greenville. Margot was torching the South Atlantic League, hitting .378/.440/.600 over his last 100 plate appearances for the Drive, and he has gone 6 for 13 with two home runs in his first three games for Salem. Currently ranked 10th in the SoxProspects.com rankings, Margot has exceeded expectations in his first full season as a professional, and his prospect status continues to climb. Another prospect who has seen his stock rise over the last few weeks is Matt Barnes. The former first-round pick has allowed seven runs in his last 32 1/3 innings, surrendering 18 hits and 10 walks while striking out 25. In his start last week, he went a career-high eight innings while allowing only one run. He got a slow start to the season after experiencing shoulder soreness in spring training, but he has rebounded nicely, and pushed his overall ERA down to 4.12. 8/18 Cup of Coffee: There were good performances at all levels of the minors yesterday, highlighted by Joseph Monge's (pictured) five hits, home runs by Garin Cecchini, Bryce Brentz, and Manuel Margot, and strong pitching from all five starters. A five-run ninth inning doomed the PawSox, as the RailRiders came back to steal the victory. Ryan Verdugo went the first four innings, allowing one run on three hits in his second start for the PawSox. Jose Valdez followed with three shutout innings, and Brayan Villarreal pitched a scoreless eighth before struggling in the ninth. He walked two and allowed a double, before Heath Hembree came in and allowed two walks and two singles to give the RailRiders the lead. Despite a Mookie Betts double in the bottom of the inning, Pawtucket could not get a run back. 8/17 Cup of Coffee: Portland took home a walk-off win, while Salem and the DSL combined for 26 runs in their victories. The rest of the system took home losses though, with Pawtucket and Greenville both giving up 9 runs, and Lowell only managed to push across one. The GCL lost both of their contests, despite holding a 10-3 lead at one point in game one. 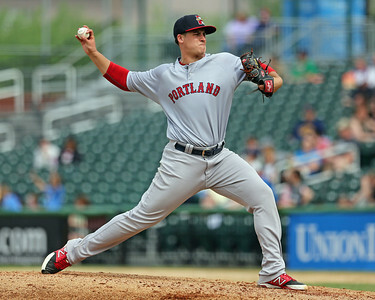 Chris Hernandez took the loss for Pawtucket, giving up four runs on eight hits and four walks in only 4 2/3 innings pitched. Miguel Celestino came on in relief and was the only Pawtucket hurler to escape the game without giving up a run. John Ely and Drake Britton combined for the final three innings and were touched up for five runs in that span. Seven out of nine Pawtucket batters had hits, while Mookie Betts and Mike McCoy were held hitless in this one. Alex Hassan led the charge, going 3 for 5 with two runs scored and a home run. Both Blake Swihart and Derrik Gibson went 2 for 4 with a walk. 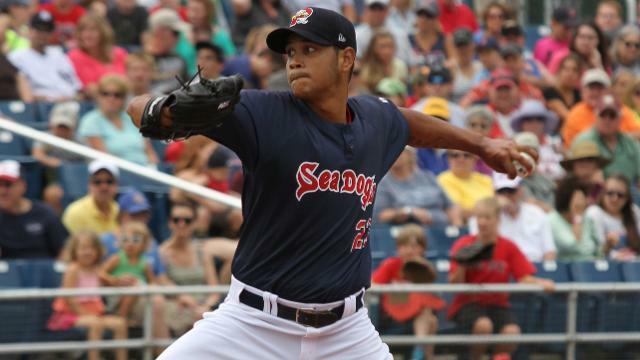 8/16 Cup of Coffee: It has been only three starts, but Eduardo Rodriguez has already turned heads in Portland, as he was dominant again for the Sea Dogs. Henry Owens was solid yet unspectacular for the PawSox, while Cody Kukuk and Trey Ball each took steps backwards last night. In the Dominican, the DSL Red Sox continued to roll behind the arm of Daniel Gonzalez. Despite striking out seven without walking a batter, Henry Owens picked up his first loss for the PawSox, as he allowed four runs in six innings of work. He gave up two home runs, and threw 60 of his 84 pitches for strikes. Dalier Hinojosa and Heath Hembree combined to shut down the RailRiders over the last three innings, with Hembree keeping his ERA at 0.00 for Pawtucket. SoxProspects.com's Chris Hatfield has confirmed that the Red Sox have promoted outfielder Manuel Margot to High A Salem. 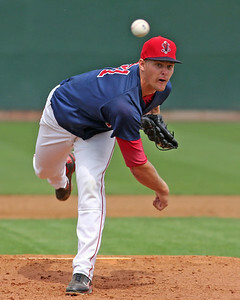 Margot has spent all of the 2014 season with the Low A Greenville Drive, and is currently ranked the #10 prospect in the Red Sox organization by SoxProspects.com. Margot's promotion was first reported by Joon Lee of OverTheMonster.com. Margot, 19, has been on a tear recently. He has hit safely in all 12 August games, going 24 for 52 and posting a slash line of .462/.509/.731. Overall on the season, Margot has hit .287/.356/.451 while leading the Drive with 105 hits and 61 runs scored. He currently leads the organization with 39 stolen bases, and has 35 extra-base hits on the season, up from the 11 he had as a member of the Lowell Spinners in 2013. 8/15 Cup of Coffee: Strong pitching was again the story on the farm, with the highlight coming in another strong outing from Matt Barnes (pictured) in Pawtucket's victory. Salem allowed only two runs to sweep its doubleheader, while Greenville lost despite an excellent outing from Ty Buttrey. The DSL Red Sox had a different approach, pounding out 20 hits to prevail in a slugfest. Portland was swept in its twinbill despite solid performances on the mound, and Lowell fell as well. The GCL Red Sox game was suspended in the fourth inning with the team trailing. The big blow in the game was a three-run homer in the third inning by Travis Shaw. Shaw is now second on Pawtucket with 10 home runs, despite the fact that he spent the first two months of the season with Double-A Portland. With two hits, he extended his hitting streak to six games. Alex Hassan also went deep with a fifth-inning solo shot. 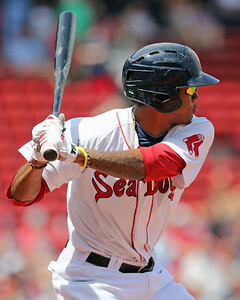 Mookie Betts added a pair of hits, raising his average with Pawtucket to .339. 8/14 Cup of Coffee: It was a full schedule of baseball on Wednesday as the affiliates went 7-1, including a Salem doubleheader sweep. The GCL and DSL Red Sox kept rolling while Pawtucket, Greenville, and Lowell all had one run victories. Edwin Escobar turned in another solid outing, hurling seven innings, allowing two runs on five hits and a walk, punching out six. Ryan Verdugo picked up the win, allowing a run on three hits in two innings of relief. Pawtucket managed just four hits, scoring their first three runs on a Deven Marrero RBI ground out, and sacrifice flies from Alex Hassan and Bryce Brentz. With the game tied 3-3 in the ninth, Blake Swihart delivered with a two-out RBI double to knock home the game's winning run. 8/13 Cup of Coffee: Greenville, GCL and the DSL Sox all brought home wins Tuesday. Three more games were lost due to rain while Pawtucket and Portland both lost one run contests. A close back-and-forth contest in the later innings broke in favor of Gwinnett, despite solid pitching from PawSox starter Steven Wright. The right-hander tossed a complete game, allowing four runs (three earned) on nine hits and a walk, striking out two. The Braves, who trailed 3-1 going into the eighth inning, took advantage of a key fielding error by Deven Marrero to rally for three runs in the eighth to take the lead. Pawtucket was relatively quiet with the bat, outside of Mookie Betts, who collected two singles and two RBI in his latest multi-hit game. Garin Cecchini added a solo home run in the ninth as he had another multi-hit evening, continuing his recent hot streak at the plate. 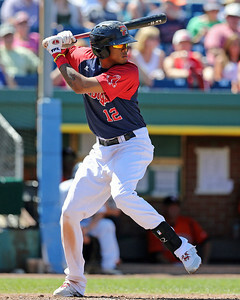 Almanzar (pictured) did most of his damage in back-to-back games at Richmond (SFG) August 8 and 9, going 4 for 9 with two home runs and a double, knocking in five runs and sealing SoxProspects.com Player of the Week honors. 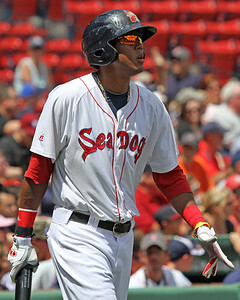 This is Almanzar's second SoxProspects.com Player of the Week award, having previously won for the period of July 14-20. Gonzalez's first start of the week saw him work a solid five shutout innings of three hit ball, striking out three and walking one against the DSL Mets August 4, but he truly distinguished himself and earned SoxProspects.com Pitcher of the Week honors with his second outing of the period, August 9 , at DSL Cardinals showing six scoreless innings of one-hit work, highlighted by ten strikeouts. He was signed as an international free agent out of Venezuela in 2012. 8/12 Cup of Coffee: Monday's highlight was one of the most wild games of the season, as Pawtucket squandered a nine-run lead before coming back in a contest where it pounded out 15 runs on 19 hits. Elsewhere, Lowell was victorious as a pair of right-handers combined on a three-hit shutout. Greenville fell in a slugfest, while the GCL and DSL squads dropped their games. The PawSox ripped 19 hits, including seven doubles, on their way to a wild victory. The team abused starter and former Red Sox hurler Zach Stewart (ATL) for eight runs in 3 2/3 innings. A pair of RBI doubles by Garin Cecchini (pictured) were at the center of the assault. Meanwhile, Pawtucket starter Chris Hernandez had the game well in control, scattering four hits across five scoreless innings, striking out four without issuing a walk. He left the game with a commanding 9-0 lead, and even after a seventh-inning solo homer off of Miguel Celestino, the contest appeared to be well in hand. Dan Butler made his major league debut in Sunday's game against the Angels, completing his rise from an undrafted free agent in 2009. The newly acquired Eduardo Rodriguez impressed in his second start with Portland, striking out nine over six scoreless innings. Another recently acquired prospect, Edwin Escobar, received his call to the majors yesterday, as Heath Hembree was optioned back to Pawtucket. 8/11 Cup of Coffee: On a day when the system's top left-handed pitcher struggled, another left-hander took a big step forward, as Trey Ball (pictured) continued to turn the corner in his first full professional season. Blake Swihart was the hero for the PawSox, while the Sea Dogs could not offer Mike Augliera any offensive support for his strong start. The PawSox were able to pick Henry Owens up after his tough start, rallying for three runs in the ninth to complete the come-from-behind victory. Owens was cruising through two innings, but he ran into trouble in the third, as the Knights got to him for four runs on five hits. Owens was able to make it through five innings while allowing only those four runs, while striking out five. Dalier Hinojosa and Alex Wilson combined to keep Charlotte off the board with two shutout innings apiece. 8/10 Cup of Coffee: Pawtucket, Portland and Greenville all took home victories, though Portland needed 11 innings and some big hits to do so. Lowell lost an early lead and took home the affiliates' only loss of the night. Meanwhile, the DSL Red Sox rode some outstanding pitching to a victory. Matt Barnes gave up two runs on four hits and three walks in six innings pitched, while striking out four. Despite pitching decently, it was not enough for Barnes to earn his sixth win of the season. Instead, Bryan Villarreal took home the victory thanks to a scoreless eighth inning. Ryan Verdugo notched the save thanks to a hitless ninth, despite walking two in the frame. The offense was held out of it until the eighth inning, when they scored three times, and followed up with another two runs in the top half of the ninth. Garin Cecchini was the only player to have more than one hit, going 3 for 5 with a double, a run scored and two RBI. The other damage came thanks to a Bryce Brentz two-run homer in the ninth and a Blake Swihart RBI single in the eighth. 8/9 Cup of Coffee: Mookie Betts (pictured) wasted no time getting back into the swing of things with Pawtucket, Eduardo Rodriguez was dominant again, and third-round pick Jake Cosart continued to impress in his limited action so far. Greenville and Lowell ended up on opposite ends of walk-off wins, and the DSL Red Sox continued to steamroll the competition. 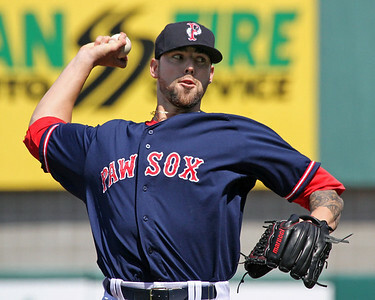 Making his first start in the minors since his major league debut last week, Anthony Ranaudo pitched into the seventh while picking up his 13th win for the PawSox. He was touched up for 10 hits in his 6 1/3 innings of work, but limited the damage to only four runs thanks to five strikeouts and only one walk. The bullpen was shaky, with Drake Britton continuing to struggle, allowing three runs while recording only two outs. Miguel Celestino came on to finish off the Knights, getting the final two outs for his third save of the year. 8/7 Cup of Coffee: Portland continued their winning ways Wednesday as the affiliates went 5-2 on the day. Salem found itself on the wrong end of a 14 inning nailbiter and Lowell's offense was punchless in a shutout loss. The DSL Red Sox scored early and often in their victory while mother nature took a break on the GCL Sox, allowing them to sweep a doubleheader. 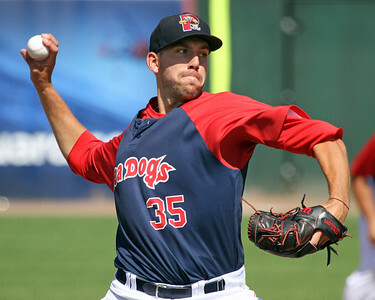 Luis Diaz got the start for the Sea Dogs, allowing four runs on five hits and five walks in 5 1/3 innings. Aaron Kurcz picked up the victory for 2 2/3 innings of scoreless relief, allowing one hit and striking out three. Dayan Diaz hurled a scoreless inning of relief to collect his first save with Portland. The Sea Dogs took advantage of four wild pitches from Bowie starter Eddie Gamboa (BAL) as well as 11 walks issued by the Baysox entire staff. Shannon Wilkerson, Jonathan Roof, Michael Brenly, Sean Coyle, and Carson Blair, all had RBI singles in the victory. 8/6 Cup of Coffee: Edwin Escobar's second start with Pawtucket ended in a loss as the PawSox offense was not able to back him up in a day matinee on Tuesday. Portland nabbed an extra inning victory while Greenville won its second in a row against Augusta. Salem was scorched in a loss while the DSL Sox ended up having their lengthy extra inning affair suspended. Escobar had a decent start for Pawtucket, hurling six innings, allowing one run on eight hits and two walks, punching out five. Miguel Celestino added 1 2/3 innings of relief, drawing the loss for allowing two runs on three hits and a walk. Brayan Villarreal tossed a scoreless inning of relief, striking out a pair. The PawSox did not collect a hit until Blake Swihart's two-out single in the bottom of the fifth. Swihart would later come around to score Pawtucket's lone run of the game on Justin Henry's bases loaded walk. Former Red Sox prospect Dusty Brown (CLE) hit two solo home runs to lead the way for Columbus. In a month with several excellent performances the standouts were the system's hottest young player and a talented pitcher looking to establish some consistency. Third baseman Rafael Devers (pictured, left) takes the honor as SoxProspects.com Player of the Month, while Cody Kukuk (pictured, below right) earns recognition as SoxProspects.com Pitcher of the Month. 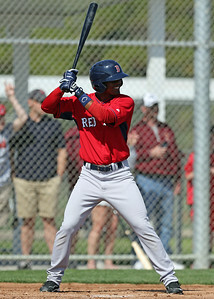 It was a whirlwind month for Devers, who jumped from the Dominican Summer League to the Gulf Coast League and also leaped up the SoxProspects.com rankings from 12th to number four. After abusing DSL pitching to the tune of .337/.445/.538, only a visa hiccup could slow the gem of the 2013 International Free Agent class. Promoted to the GCL on July 4, Devers didn't miss a beat. The precocious 17-year-old appeared in 22 July games after the promotion, hitting .372/.438/.564 with seven doubles and a pair of home runs. Kukuk had been inconsistent following an April promotion to the Carolina League, but the big lefty really hit his strike for Salem in July. The seventh-round pick from the 2011 draft allowed only six earned runs in 26 1/3 innings on the month, good for a 2.05 ERA. He struck out 35 while walking 15. Perhaps most impressively, in 109 July plate appearances against Kukuk he did not allow a single extra-base hit. His best start came on July 25, when he dominated the Myrtle Beach Pelicans, striking out 10 and allowing only two hits in six shutout innings. PAWTUCKET, R.I. -- Henry Owens often dazzled and shut down opposing offenses for over a year in Portland. On Monday night, he finally got his chance to prove he could continue to do that at the highest level of the minors in Pawtucket, and he did not disappoint. He did not allow a hit until the sixth inning of his Triple-A debut, struck out seven in the first three innings, and left to a raucous standing ovation that he said gave him chills. According to the catcher who came up with Owens and was promoted just before the game to catch his first start, the transition did not phase the tall lefty at all. “He looked like he was having fun out there. 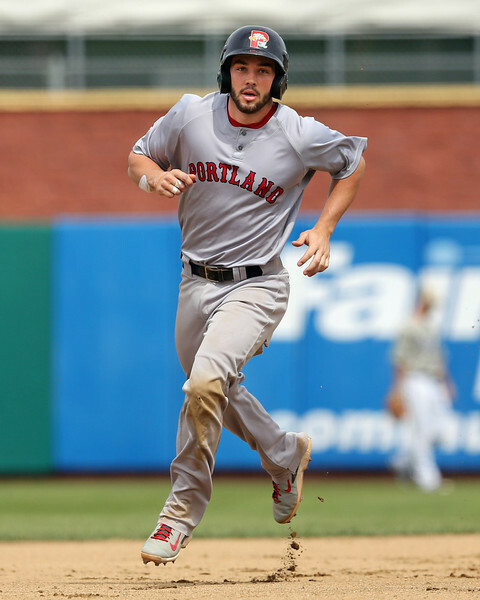 Same old Henry, going out there and competing,” Blake Swihart said following the start. Barnes put together his finest performance in weeks August 2 against Columbus (CLE), striking out ten in seven no-hit innings and allowing only two walks. Having struggled all year with inconsistency, this outing represents the third solid start in an row for Barnes and may represent the start of a strong push to season's end. Barnes's strong performance drew all but one vote in this week's Pitcher of the Week polling. 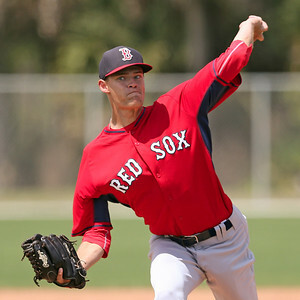 He is currently the twelfth-ranked prospect in the organization by SoxProspects.com. 8/5 Cup of Coffee: A new battery arrived in Pawtucket Monday to lead the charge for the stretch run. 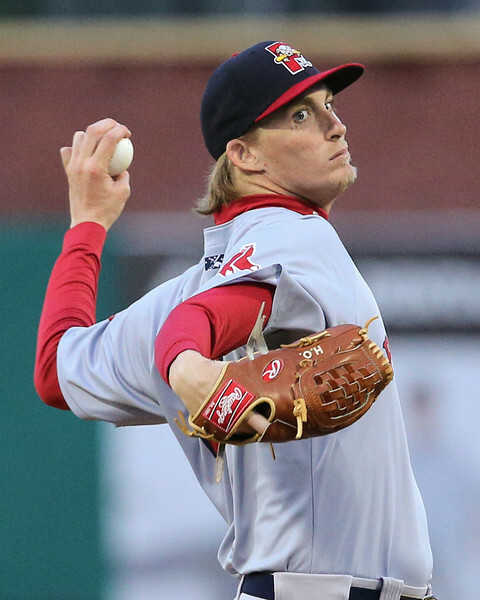 A few days after announcing that number three prospect Henry Owens (pictured) would make his Triple-A debut on Monday, the team promoted his frequent teammate and number two prospect Blake Swihart to join him. 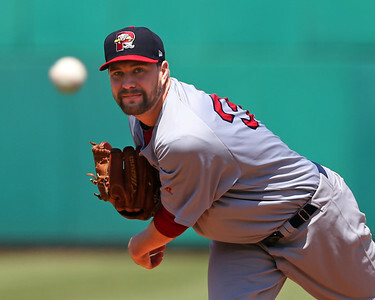 The results were fantastic, as Owens tossed a gem in the PawSox win. Elsewhere on the farm, Lowell swept its doubleheader, and Greenville waited 15 innings before walking off with the win. The GCL Red Sox cruised to victory, while the DSL team fell in extra innings for the organization's only loss of the day. 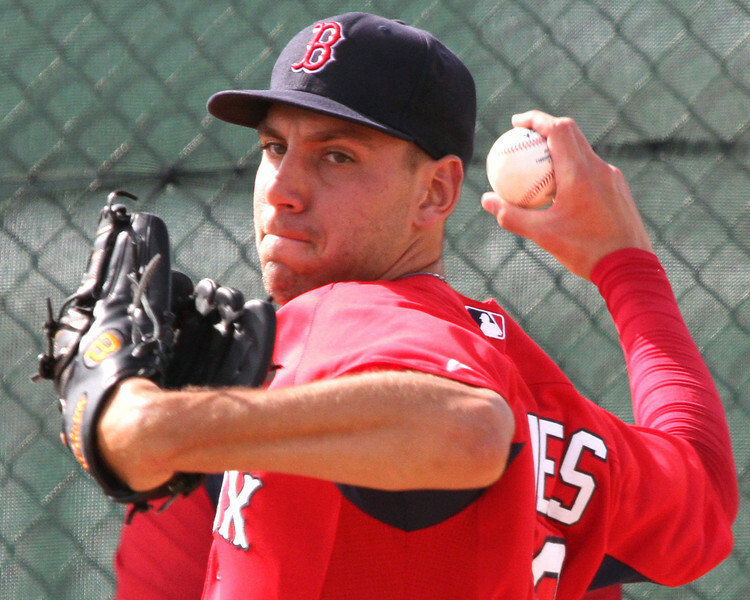 The much-anticipated Triple-A debut of Henry Owens exceeded all expectations. The 6-foot-7 lefty retired the first eight batters he saw and brough a no-hitter into the eighth inning. Only one player reached as far as third base in Owens' 6 2/3 innings. Overall he scattered two hits, walking three and striking out nine. Owens seems to have a fondness for grand entrances: he struck out 11 in six shutout innings in his Double-A debut, and fired six no-hit innings on opening day for Portland. 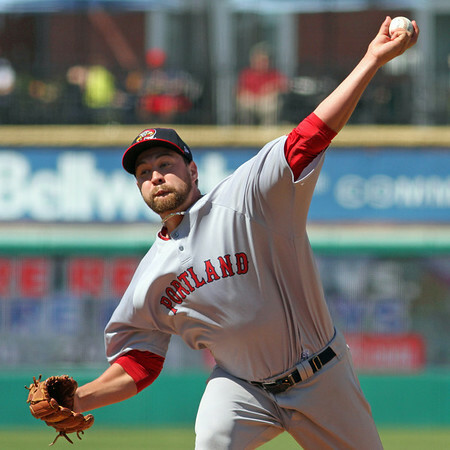 Owens was joined in Pawtucket by frequent batterymate Blake Swihart. With the exception of August 2013, Swihart and Owens have been teammates at every step since the two were taken in the first round of the 2011 draft. The catcher went 0 for 3 in his Triple-A debut. Bryce Brentz led the offense in his second game after missing 10 weeks due to a hamstring injury. Brentz was 3 for 4 with a double and home run. Justin Henry was on base four times, going 3 for 3 with a walk. According to multiple reports, the Red Sox will add a pair of players to the major league roster to join the team Tuesday for their series against the St. Louis Cardinals. The team will recall reliever Heath Hembree (pictured), acquired in the deal that sent Jake Peavy to San Francisco, and purchase the contract of outfielder Corey Brown. Both signings were confirmed by Joon Lee of OverTheMonster.com. Brian MacPherson of the Providence Journal has confirmed that righty Steven Wright will be optioned to Pawtucket to open up one roster spot, and another move will need to be made before Tuesday's game. Hembree, 25, has appeared in two games for Pawtucket since the July 26 deal, striking out four in a scoreless 1 2/3 innings. Prior to the deal, he pitched 41 times for Fresno of the Pacific Coast League. There he had a 3.89 ERA in 39 1/3 frames, striking out 46 and walking 13. Hembree previously got a taste of the major leagues as a September call-up with the Giants in 2012. He appeared in nine games, allowing only four hits in 7 2/3 scoreless innings, striking out 12 and walking two. The fallout from the Red Sox feverish trade activity last week continued Monday as catcher Blake Swihart was promoted to Triple-A Pawtucket, according to Brendan McGair of the Pawtucket Times. Swihart, 22, has spent all of the 2014 season in Double-A Portland where he produced a line of .300/.353/.487 in 347 at-bats across 92 games. He's belted 12 home runs and collected 55 RBI on the season. The switch-hitting catcher has steadily climbed through the organization since being drafted of Cleveland High School in New Mexico. 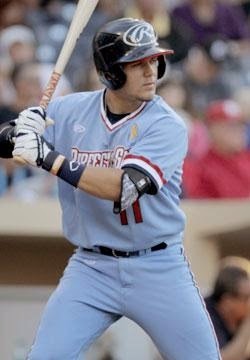 The 6-foot-1 Swihart is the #2 ranked prospect on SoxProspects.com and was named to the Eastern League All-Star team this year. Check out our monthly Minor League Notes column on ESPN Boston. It's surprising that, in what some are calling the most active trade deadline in Red Sox history, there were not an exorbitant amount of additions to the minor league system. That does not mean, however, the effect of the trades were not felt throughout almost every level of the organization. For a comprehensive look at all the deals and what they mean check out this breakdown from SoxProspects.com's Chris Hatfield. 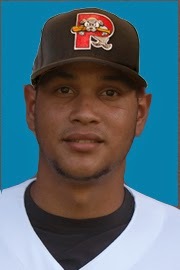 The newsworthy addition to the system was 21-year-old Venezuelan left-hander Eduardo Rodriguez (Pictured), who was acquired from the Baltimore Orioles in the Andrew Miller trade. Despite having an up-and-down season -- he had a 4.79 ERA and 1.44 WHIP in 16 starts for Double-A Bowie -- Rodriguez was highly regarded within the industry and was consistently ranked as the Orioles #3 prospect. In a scouting report on ESPNBoston.com, SoxProspects.com's Ian Cundall writes that Rodriguez projects as a back-end of the rotation starter. Cundall writes that Rodriguez has a smooth, repeatable delivery and sits in the low-90's with his fastball. He needs to improve on his consistency and command of his secondary pitches, a slider and curveball, Cundall writes. Rodriguez impressed in his first start in the Red Sox organization; he allowed only one run and struck out seven batters in 5 1/3 innings for Double-A Portland. 8/4 Cup of Coffee: Eduardo Rodriguez did his best Henry Owens impression, taking both his turn in the Portland rotation and his number, while leading the Sea Dogs to a win. 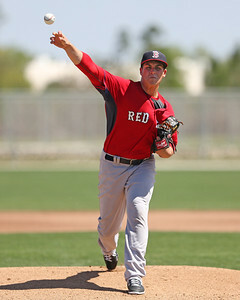 Daniel McGrath also had a good outing, while Sam Travis (pictured) continued to pace the system with his offense. Making a spot start after Steven Wright was called up to Boston, Ryan Verdugo went the first 3 2/3 innings, allowing three runs on three hits, walking two and striking out six. Chris Hernandez did not fare any better, allowing six runs in his 2 2/3 innings of relief, including a grand slam in the top of the seventh that blew the game open. Dalier Hinojosa pitched well in the final 2 2/3 innings, allowing only one hit. 8/3 Cup of Coffee: It was a tough night offensively for Pawtucket and Portland as they managed only 13 hits and three runs between them. The system managed a split, with Salem, Greenville and the DSL all picking up wins. The GCL lost a close one and the Spinners were postponed. Matt Barnes(pictured, right) plowed through the Clippers lineup, no-hitting them through seven innings. Barnes ended the night with two walks and 10 strikeouts on 106 pitches. Miguel Celestino then blew the save, allowing a run in the eighth. After Heath Hembree pitched a scoreless 2/3 of an inning, Jose Valdez came in and took the loss after allowing a run in the top half of the 11th, his second inning of work. The PawSox managed only seven hits, with Bryce Brentz collecting two of them, and Travis Shaw notching the only run and extra-base hit for Pawtucket. 8/2 Cup of Coffee: As the calendar flipped to August, a full slate of games were on tap. 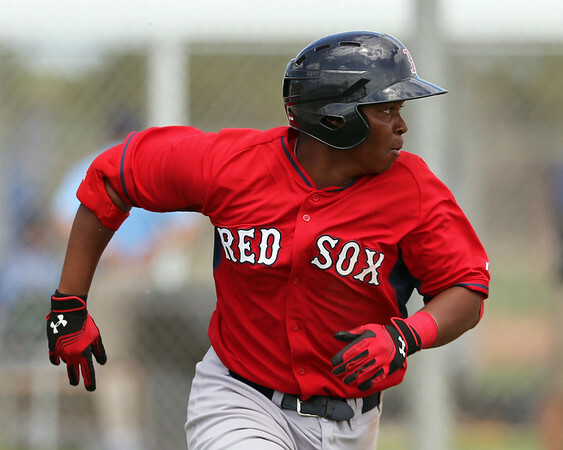 After leading the GCL Red Sox in almost all categories in July, Rafael Devers (pictured) opened August without missing a beat, driving home the winning run in the bottom of the ninth. Lowell scored three in the ninth to complete its comeback, while the DSL Red Sox staved off a late rally. Salem used a 13-hit attack to come away victorious. Playing with a depleted roster, Pawtucket dropped its chance to take sole possession of first place. Portland only managed two hits in its loss, and Greenville continues to slide. Pawtucket and Syracuse entered the night in a virtual tie for first place, but it was a tall order for the PawSox, having sent five players to Boston earlier in the day. John Ely, regularly a member of the Pawtucket bullpen, made his first start of the season. Ely allowed three runs (two earned) in three innings, striking out five while walking only one. Mike McCarthy, received from Portland earlier in the day, followed, giving up one run in his three innings of work. Drake Britton continues to struggle, allowing a pair of solo home runs in 2 1/3 innings. Britton has allowed at least one run in 19 of his 36 appearances this season, and hasn't had consecutive scoreless outings since May 11 and 14. Corey Brown, who was a member of the Chiefs from 2011 to 2013, ripped a second-inning solo homer off his old squad. Carlos Rivero and Dan Butler had two hits apiece for the PawSox. Butler was taken out of the game in the seventh inning, following a play during the major league game where David Ross limped off with a foot injury.